Parsley tea is a cleansing herbal tea that is easy to make and ideal to drink when you need to flush your body of toxins. This herb is known as a culinary and seasoning herb. It is added to a vast number of dishes to enhance flavor or as a simple garnish. While almost most people are familiar with the uses of parsley in the kitchen, the healing benefits of this herb are less known. As a medicinal herb, parsley has a great number of benefits that you can make the most of just by drinking a cup of this tea on a regular basis. Come and enjoy this cleansing tea! 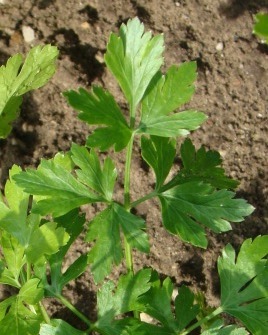 Parsley, petroselinum crispum in Latin, is a biennial herb that may reach up to 30cm in height. It is native to the Mediterranean region, although it is now cultivated world-wide as a culinary and seasoning herb. This is a common plant to find in an herb garden. You may even grow it in a window box as long as you water it regularly. 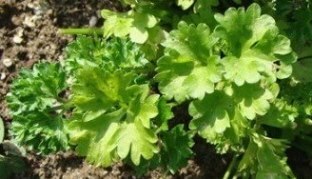 The parsley plant has small white flowers blooming in bunches with small seeds. 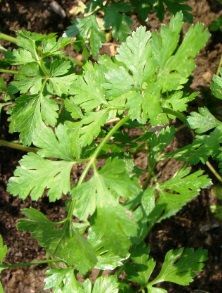 Its leaves, the essential part of the plant used for making parsley tea, are bright green and may be either flat or curly. The leaves are best harvested in spring and in autumn. There are several kinds of parsley, but the most commonly used are: curly leaf parsley; flat leaf parsley; and Italian parsley. Take note that the herb commonly known as Chinese parsley is actually coriander or cilantro, not the same species as parsley (petroselinum crispum). Parsley has a long history of use as a medicinal herb and as a religious symbol. In ancient Greece this herb was used for its medicinal properties, toning digestion and the female reproductive system. It was also associated with the goddess of the underworld, Persephone. In ancient Rome, parsley was viewed as a sacred herb used in religious ceremonies, such as burials and funeral banquets. It was also used as a garnish for food and wearing it was thought to stimulate the brain as well as the appetite. Today this herb is still highly regarded for its many health benefits and it has made its way as a permanent presence in European, Middle Eastern, American and Asian cuisines. Parsley oil has also found its way as a fragrance into the world of cosmetics, in soaps and perfumes. Parsley is a seasoning herb that is rich in vitamins A, B, C, E and K, as well as other element such as calcium, iron, magnesium, phosphorus, potassium, fibers and antioxidant flavonoids. Drinking this herbal tea is a great way to reap many of the benefits of parsley. The best known benefit of parsley tea is its diuretic action. Antioxidants and chlorophyll in this infusion may help flush out harmful and toxic elements that cause inflammation and infections. This tea may be used as a form of treatment for arthritis and rheumatism, flushing out liquid deposits and reducing swelling of joints. A cleansing tea like this one may also prevent water retention and so help reduce cellulite by reducing excessive fluid in tissues. Parsley herbal tea also stimulates the lungs to discharge and eliminate pollutants that may have been able to accumulate in your respiratory system, letting you breathe better as well. The diuretic action of parsley tea also helps to boost urine flow, clearing out the kidneys and bladder of toxins and thus resulting in healthier cleansing and purifying of the blood. Parsley tea is often recommended for kidney stones, but you should talk to your doctor before using this herbal remedy. There seems to be evidence that with more serious kidney diseases, this tea could aggravate the situation. Drinking this tea may treat mild kidney ailments and bladder infection, known as cystitis. It may help reduce swelling of glands as well as treat other urinary tract infections and prostate conditions. This detox tea may also prove helpful for the liver, promoting healthy liver function, cleansing it of foreign harmful agents. This may also improve your skin, making it look fresh and healthier. If you suffer from indigestion or nausea, you can always try drinking parsley herbal tea before your meals. The enzymes in this tea could help your stomach to function better, reducing acid reflux and stomach spams and cramps. 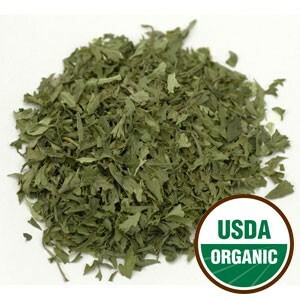 Parsley tea may also help the intestines to function better, eliminating unnecessary fats and wastes from the body. It may also help treat flatulence, bloating, colic and painful constipation. This tea may also treat mouth infections. With healthy gums and teeth, you greatly reduce the occurrence of bad breath. This tea may also serve as a weight loss tea, because as it promotes a faster and better digestion, it allows your body to better absorb the nutrients you need from food and rid it of unwanted harmful elements and excessive fluids. A cup of parsley herbal tea may help improve your heart health. The vitamin and antioxidant content in this tea may help to reduce bad cholesterol in the blood as well as regulate blood pressure. Note: If you are taking heart medication, make sure to talk to your doctor about taking this tea medicinally, to prevent sudden drops in blood pressure. Parsley tea may also help strengthen blood vessels as well as helping to repair them. This could be very useful in preventing heart problems or stroke. Parsley tea may be viewed as a female tonic because when it cleanses the liver, it also helps to promote hormonal balance that is essential for a healthy reproductive system. This herbal tea may also work as a uterine tonic, helping to regulating your menstrual cycle. This could be useful for women with delayed or scanty periods. It stimulates the uterus, easing menstrual cramps and preventing PMS. Some women find this tea useful to contract the uterus after childbirth, but make sure to talk to your doctor before using this herbal remedy, because it will interfere with breastfeeding. Parsley herbal tea is a source of minerals and vitamins that may help you recover from physical exhaustion. This herbal infusion is particularly rich in iron and vitamin C, which are essential to fight anemia. This tea helps the body to better absorb the nutrients it needs to keep its strength and boost the immunity system. This prevents the onset of disease and speeds up recovery time when illness does occur. Drinking parsley tea regularly may also help your intake of vitamins D and K, and calcium, which help to keep your bones healthy and strong. The presence of antioxidants in this tea is also said to help protect and stimulate the brain function, maintaining your brain active and healthy. Parsley is also a natural antihistamine, meaning that drinking this tea may help you fight allergies, hay fever, coughs, asthma and other respiratory ailments. Parsley herbal tea is rich in flavonoid antioxidants, which are protective components that may help inhibit the growth of tumors. The antioxidant protection this herb provides may help prevent the damage to cells that could lead to mutation and cancer. Antioxidants in this tea may also have slow down premature aging of the body and skin by preventing inflammation and damage caused by free radicals on your body. This may prevent eye or neurodegenerative diseases. 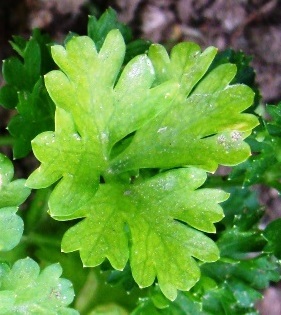 There is evidence that applying parsley tea to the skin could help clean and heal light bruises, such as insect bites, parasites and lice, for example. Its antiseptic and antifungal action may be ideal to clean blemish and other skin illnesses. Parsley infusions can be used externally to treat skin ulcers and rehydrate cracked or chapped skin. Apply it gently to moisturize dry skin. Have a sip of Parsley Tea! While drinking parsley tea regularly may help you deal with a number of ailments, there are also some issues you should be aware of. Always stay within the recommended dosage, as too much may cause anemia, kidney or liver problems. When applying this infusion on your skin, make sure to test it on a small area first as you may be sensitive to it and develop an allergic reaction in the form of a rash or a more serious skin irritation. 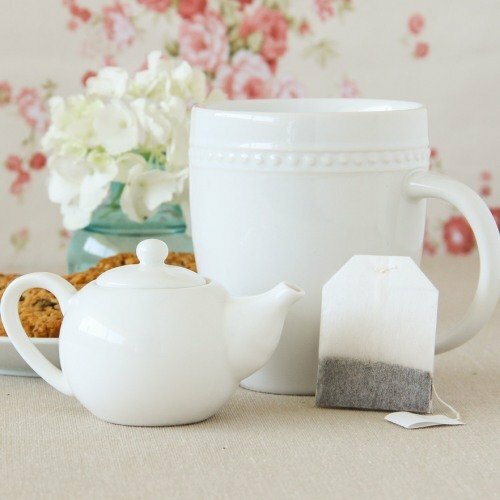 Taking this tea regularly could cause your blood sugar levels to drop, so if you have diabetes, make sure to properly monitor your sugar levels and seek the advice of your doctor. If you are pregnant then it is best to avoid drinking parsley at this stage. This herbal tea is stimulates the uterus to help bring on delayed periods and so could cause a dangerous miscarriage. While breastfeeding it is also not recommended that you drink this tea medicinally unless recommended by your doctor. If you have a history of serious kidney inflammatory disease, then you should avoid drinking this tea as the oxalic acid present in the herb may promote the formation of kidney stones. This tea is only advisable for mild conditions. Two weeks before any surgery, stop drinking this tea. Parsley tea might interfere with your sugar levels and make you weak during the recovery stage. 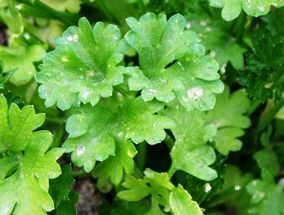 If you are taking medication for blood clotting or any other forms of diuretic drugs, then do not take parsley tea as it may interfere, enhancing or hindering, the effects of these medications. If you are unsure about this herbal tea, you should talk to your doctor and then start off with a small amount of tea per day. Let’s take a quick look at how to make parsley tea and soon you will be reaping the benefits of this great tea. You can use fresh or dried parsley to make your cleansing tea. If you are using fresh leaves remember to thoroughly wash them thoroughly before using, even if they come from your own herb garden. As you wait for the water to boil, finely chop about 2 to 4 tablespoons of fresh parsley per cup of water. If you are using dried parsley, you need about 2-4 teaspoons of the herb per cup of water. Place your herb in the teapot and then pour over it the boiling water. 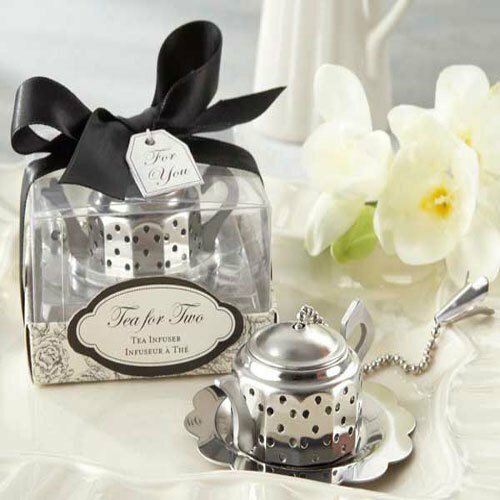 Let your tea steep for 5 to 10 minutes. The longer it steeps, the stronger your tea will be. Strain the tea and discard the used parsley. Since most of the nutrients have been released into the water, reinfusing the same leaves would result in a weaker and less effective tea. You should get a nice green tea. 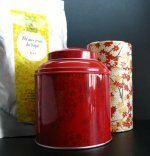 This tea may have a strong and bitter flavor so sweeten it with honey and add a bit of zest with a squeeze of lemon juice. Drink your tea and enjoy. Parsley herbal tea is a wonderful cleansing tea that you may drink up to 3 cups a day, preferably before your meals. It is best to drink for about a week and then take 3 days off to let your body adjust and see if you no longer need this tea. It’s is best to use fresh rather than dried parsley. The fresh leaves are considered more potent, as some of the nutritious elements in the leaves may weaken during the drying process. For digestive relief, you may blend this herb with mint to create a soothing and more palatable herbal infusion. In the summer, prepare a glass of iced parsley tea. It will help you keep cool and at the same time keep allergies at bay. Use this tea as a flavoring agent. Enhance dishes such as rice, potato or fish, meat and vegetable stews. Buy Your Parsley Tea Today! Click on the image or on the link below to purchase from Starwest Botanicals your Organic parsley leaf. Organic parsley leaf flakes ready for use either for your daily cup of tea or for seasoning any dish. If you prefer, there is also the possibility of making your tea using leaf powder. Parsley tea is a wonderful detox tea that you can easily make and improve your health a cup of tea at a time.